I know it is a random pairing, but I grouped these two topics together, omelets and picnicking, because they are two of my favorite food activities. I wish I could add food trucking to my list of tops, but they just don’t make the grade, mainly because I like to sit comfortably while eating my meals and food trucks don’t really cater to that…unless you are near an area with picnic tables...? My digression has some meaning, I will circle back to food trucks later. I think my favorite part about picnicking is that for me, it always comes with wine. 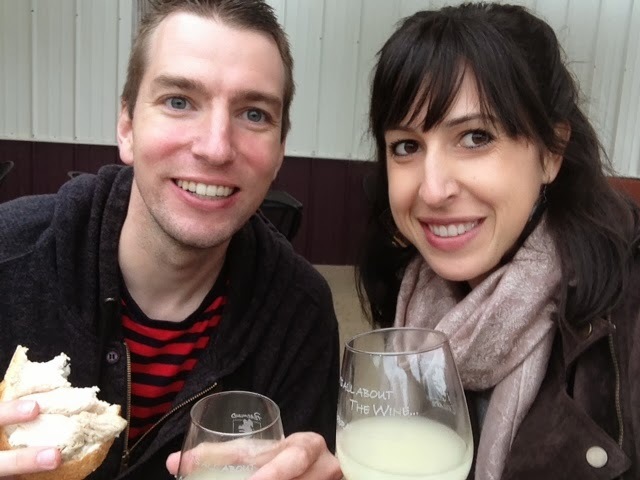 Last weekend Travis and I drove out to the boons of Virginia to a cute little winery called Pearmund Cellars. We enjoyed a tasting of about 12 different wines - much more generous than the California wineries we used to frequent. And the wines were delicious. We purchased a Viognier, a Cabernet Sauvignon and an awesome late harvest white wine which tasted like a softer version of the heavy ports we like to enjoy on cold winter nights. We got free glasses of wine from the fermenting steel barrels (not sure if that is correct wino terminology) to pair with our picnic. It was great because it was still on the sweeter side and went perfectly with our cheese and sourdough. BTW we finally found REAL San Francisco sourdough at Trader Joes – they don’t have the real stuff in the grocery stores out here on the East Coast. 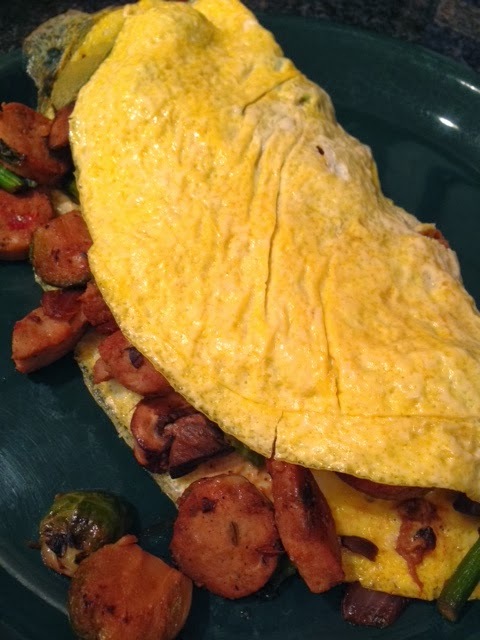 Later last week I was craving breakfast for dinner so I made some hearty omelets with a plethora of leftover meat and veggies we had lingering in our fridge. So random, but it definitely hit the spot. 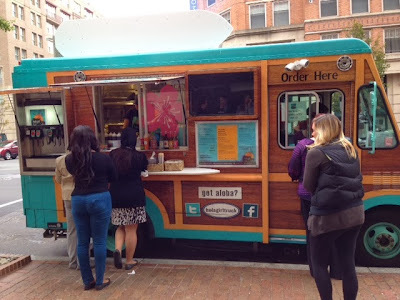 Now back to the food truck craze. I honestly have never been wowed by food truck food until this particular lunch. It just seems like a “dirty” concept and I am totally all about the ambiance when I dine out. But this food was MIND-BLOWING. The truck is called Hula Girl and it serves Hawaiian food. I had to get the huge “Mixed Platter” because I wanted to try everything. 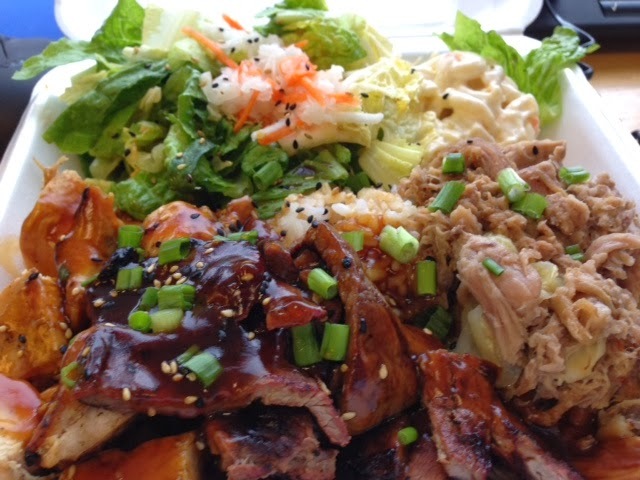 So glad I went for it – this $13 lunch lasted for three full meals. So maybe I wrote off the food trucks too soon. Check back soon for an awesome chili recipe I am working on this weekend! 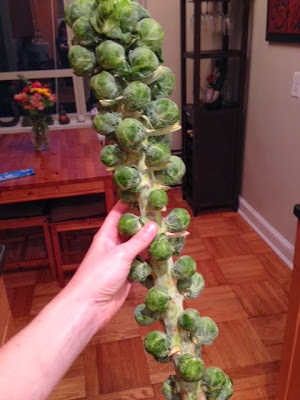 seriously i know that baby cabbages "on a stick" as i call it are the cheaper way to go but it is so worth it to me to pay a little extra for less prep. it's like you said there's already enough prep with baby cabbages! i just ADORE port and late harvest wine. nice to find a fellow lady who does! and i'm with you on the food trucks in terms of lack of ambience and lack of place to sit. it's the same reason i don't like going to restaurants without a waitstaff. not that i'm lazy but i love the whole drawn out experience of dining out! and sitting and relaxing.